The pressure he was feeling is understandable. Parra is responsible for several of the most coveted Air Max 1 colorways in history (2005’s Brownstone/Blue Reef-Dark Oak version, for example) and it has been almost a decade since the last one dropped. “There are two people who sit on your shoulder and watch what you're doing all the time. One says, ‘The collector is going to like this,’” he explains. “And then the opposite, which queries: ‘How does somebody who is 17 or 18 years old — with no idea about what I did before — how are they going to look at this?" 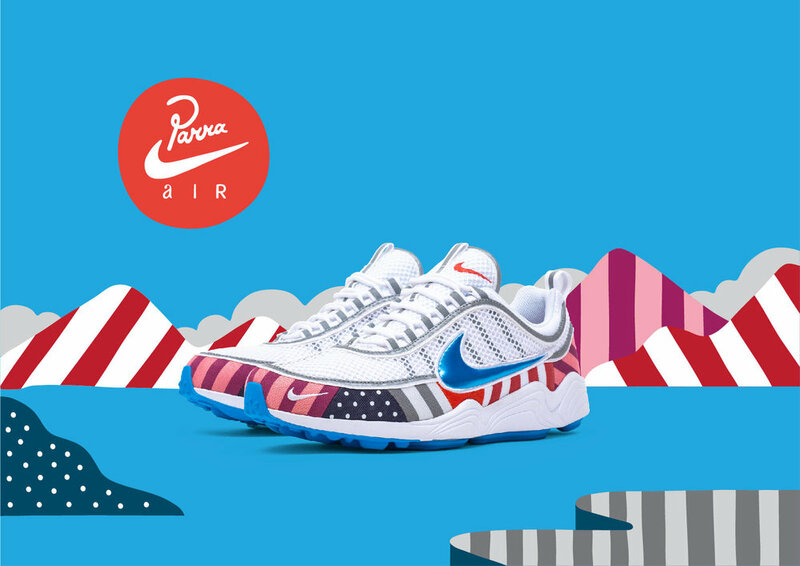 Since his last Air Max 1 with Nike in 2009, Parra’s work has shifted from the typographical humor he was once known for toward an experiment with abstract compositions. He transitioned from working as an illustrator/designer to focusing more on painting and gallery exhibition. If the first of Parra’s works with Nike were on what were known as City Packs, this current collaboration could be defined as a revival of that spirit — with both idea and opportunity expanded. This is reflected in the flat representation of city and countryside that forms a pattern that was applied to both the Air Max 1 and the Zoom Spiridon. Releasing at selkected retailers worldwide on July 21.